During a business trip gone wrong, Tony Stark is kidnapped and forced to create a mega-missile for a group of radicals. Much to the surprise of his captors, Stark instead creates a super-suit powered by an arc reactor chest-piece. 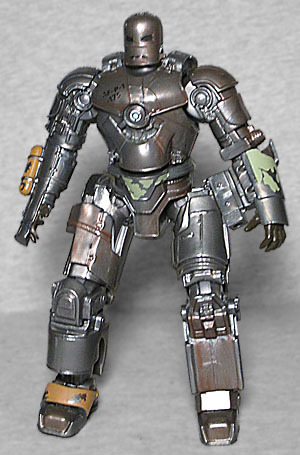 Now weaponized, he escapes in what becomes known as the Mark I armor of the tech-powered hero, Iron Man. This set is all about the easy repaints. The heir of Stark Industries, Tony Stark does not realize the impact of his weapons of war until he is kidnapped and forced to build one or die. 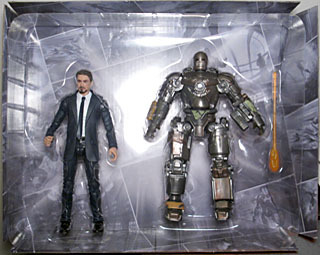 Tony Stark is, as predicted three years ago, built using Hasbro's suit body, which is both good and bad. 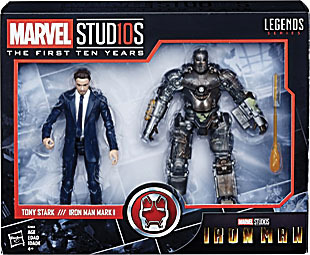 Good, because if anyone deserves to just be a guy in a suit, it's CEO Tony Stark, and because this body has good articulation; bad, because this mold is used so infrequently that there's no financial incentive for Hasbro to remold the legs and fix that damn pigeon-toed stance. The suit is dark blue, but if this is supposed to represent when he was showing off the Jericho missle system, it should have pinstripes and his tie should have lighter speckles on it. The fact that this figure has a Robert Downey Jr head proves that the fears and concerns expressed in the Iron Man Mk.7 review were unfounded - Hasbro totally has the rights to his likeness. So why didn't they use it there? Apparently there was another Tony available as this year's Marvel "please subscribe to our digital comics service" incentive, but this one gets the Photo Real printed paint, making it look lots better. So that's one repaint down. Let's look at the other. Tony Stark creates a suit out of weapons materials and escapes from confinement in a clanking suit of metal later known as Mark I. At last, someone has clarified who built this, where, and from what materials! I'm surprised the movie was so vague about it. Although, quick side note, since it's unlikely we'll ever have the chance to bring this up again: did you know the scientist Obadiah Stane is yelling at in that scene is Ralphie, from A Christmas Story? It's probably not safe to have him working on weapons systems anyway; he'll shoot his eye out. I never got the Mark I armor, so I was really glad to see it being re-released for this set. I no longer need to try to get the Revoltech version! It really is impressive how much like the comics' first appearance armor the movie design is - especially the helmet, which copies the shape of the eyes and the mouth almost directly. The rest of the suit gets a lot more detail, for realism's sake, but this is still recognizably the first Iron Man, setting an important benchmark for the MCU. For all the pertinent commentary on the design and the quality of the sculpt, we'll direct you to our existing review, because everything said there remains true today: the proportions are symmetrical even if the details aren't, the articulation would be better if it weren't restricted by the irregular armor plates, and the "flamethrower" action feature is forgivably obtrusive because the real suit had similar things on it. 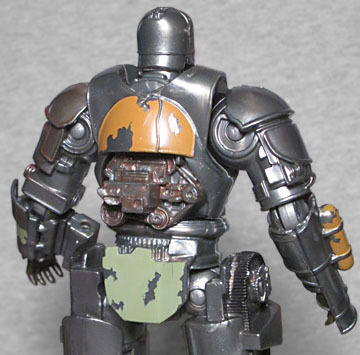 This one gets more extensive paint apps, though not neccessarily "better" ones: the toy a decade ago had an orange drybrushing to bring out all the sculpted edges and make the suit look like aged, second-hand metal; this one has something similar, but the base grey is so dark that it's hard to see; the bits that really stand out are the olive and mustard splotches painted on some of the panels, matching the worn paint seen in the movie. There's a stenciled serial number on his chest, and instead of a solid white dot, his arc reactor actually gets some detailing. This isn't quite "high-end collectible" paint, but it's better than before. Circa 2005 or 6, I was driving to work one day and the radio station was having some trivia contest to give away tickets or CDs or whatever. The question they asked the caller was "what is Tony Stark's secret identity," and it took several people before someone got the right answer. Can you remember that? A time when Tony Stark was not a household name on par with Bruce Wayne or Clark Kent? It was only a little more than a decade ago, and now he's solidly embedded in pop culture. This set is not without its flaws, but it's an appropriate commemoration of the film that started it all.